The sink hole that appeared in San Pedro along Pase del Mar a few weeks ago ( see Dangerous Sink Hole Appears in San Pedro ) is in the same area as the Sunken City landslide. This is an area in the Pt. Fermin area where a landslide which began in 1929 and then accelerated in 1939-1940 destroyed part of Paseo del Mar. and several homes. 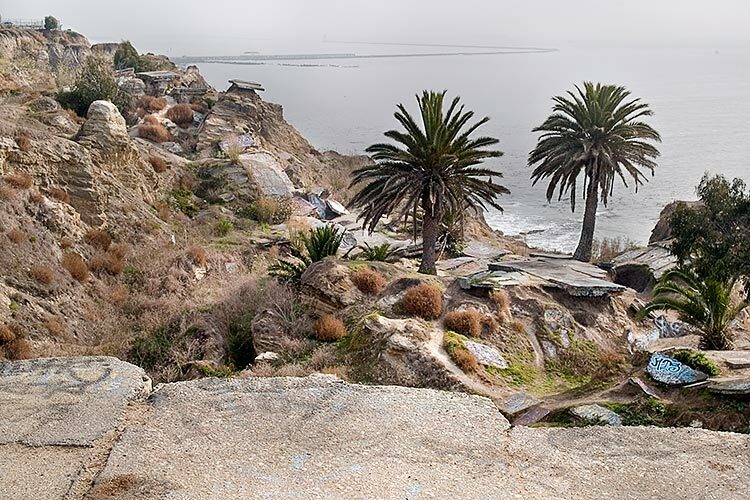 It is now a jumble of rolling land with palm trees, isolated slabs of the old road, tilting sidewalks, streetcar tracks, and remnants of house foundations, and chimneys above the surf-swept rocky seashore.